3. Review and update your estate planning documents and your financial plan with your professionals in the next twelve months, especially if you haven’t done so in the last few years or if you’ve experienced any life events, such as the birth of a child or a divorce. Sometimes old, stale documents can be worse than having no estate planning at all. 4. If you have a revocable living trust, work with your estate planning team to ensure that your investments, insurance, and other assets are properly titled into your trust. This is called funding a trust, which is a critical part of the planning process that many people overlook. When it’s not done, the trust doesn’t do you much good! Unlike wills, trusts can help families avoid probate court entirely, but only when properly funded. 5. Have the conversation with your loved ones about their estate planning. Remind them how important it is to have power of attorneys, a will, and for most people, a trust. 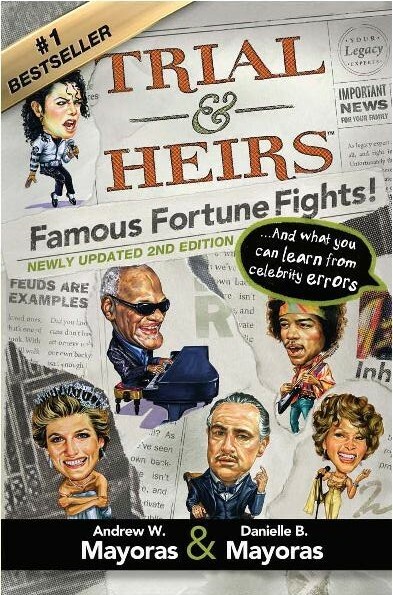 The celebrity stories in Trial & Heirs are a great way to get this conversation started! In fact, we recently put together our Trial & Heirs’ list of Top Ten Celebrity Legal Battles of 2015, which are a great way to get the dialogue flowing. We share a lesson with each one, from Bill Cosby and Charlie Sheen’s many lawsuits, to Gwen Stefani and Madonna’s divorce drama. We also include the top estate battles, including those surrounding Robin Williams and Whitney Houston’s daughter. Feel free to share these New Year’s Resolutions with your family members, loved ones, clients and prospects to help motivate them to get their estate planning in order. We wish everyone a happy and prosperous 2016!